For office environments, the aesthetic of mass timber can be a particular draw, resulting in higher rents and longer-term tenants. The Radiator in Portland, Oregon—a five-story, Type IIIA project completed in 2015—is part of a surge of mass timber offices in the Pacific Northwest. Designed by PATH Architecture for the Kaiser Group, gravity loads for the 36,000-square-foot structure are handled through a system of glulam beams and columns, while a mass timber deck with wood structural panels creates the structural floor diaphragm, and dimension lumber walls sheathed with wood structural panels provide shear capacity. Beams, columns, and the underside of the floor decking are all left exposed, contributing to the interior’s contemporary industrial character. Further expanding the possibilities, the seven-story, 220,000-square-foot T3 building in Minneapolis, Minnesota, includes a mix of glulam columns and beams, NLT floors, and a concrete core. Architect Michael Green, a long-time advocate of using wood to reduce the carbon footprint of buildings, calls the Type IV project “a game changer for the commercial building industry and a milestone for mass timber construction in the United States.” In addition to its carbon benefits, Green cites the ability of modern wood products to bring warmth and beauty to the interior, while promoting a healthy indoor environment. Demonstrating some of the efficiencies associated with mass timber, the wood structure of T3 took an average of nine days to erect per 30,000-square-foot floor. More than 100 truckloads of glulam and NLT panels arrived as they were needed at the project site, with steel connections preinstalled, allowing the structural components to be assembled quickly. The project team estimates that it is 30 percent lighter than a comparable steel design and 60 percent lighter than post-tension concrete. Reasons to use mass timber in public and institutional buildings are similar to those for offices and schools, including carbon footprint, and wood’s biophilic effects. The aesthetic possibilities are also exciting to many designers. In the United States, examples include Chicago Horizon, a Type IV public pavilion designed by Ultramoderne for the Chicago Architecture Biennial. Elegantly crafted, this award-winning structure includes a CLT roof supported on 13 glulam columns distributed in a radial pattern to address lateral loads and uplift. The pavilion represents the first use of exposed CLT in the city of Chicago, providing local precedent for the approval and use of mass timber for government and public assembly applications. In addition, the two-way slab roof is the first of its kind, suggesting new opportunities for open-layout buildings made from CLT. The planned long-term use of the building as a commercial vendor and public assembly space is a significant and sustainable departure from the typical design exhibition model of temporary installations. With a growing body of research supporting the positive impacts of wood on occupant well-being, there is also a trend toward the use of mass timber in healing environments. Mass timber has a number of characteristics that make it attractive for schools and universities—from the ability to construct an entire project over the summer while students are off campus, to the potential efficiencies of replicable modular designs, a lighter carbon footprint, and the positive impacts of exposed wood on student well-being. For a 14,000-square-foot addition to Common Ground High School in New Haven, Connecticut, for example, Gray Organschi Architecture and engineering partner Bensonwood chose a combination of CLT and glulam. CLT panels provide the tension surface (and final ceiling finish) in a system of prefabricated stressed skin assemblies that span the upper classrooms and circulation spaces. Vertical CLT panels form bearing and shear walls throughout the building, while glulam rafters and heavy timber trusses span a large ground-floor multipurpose space. A treated glulam bridge deck on laminated timber piers provides access from the upper campus. Organschi also stressed construction speed. Assisted only by a mobile crane, a five-person assembly crew installed the entire primary structure and enclosure in just four weeks. Common Ground High School is Type VB Construction, fully sprinklered, and was designed under the 2005 Connecticut State Building Code. Another example, the Design Building at the University of Massachusetts – Amherst (UMass), features an exposed glulam post-and-beam structure, CLT decking and shear walls, CLT/concrete floors (rigidly connected by glued-in steel fasteners), and a ‘zipper truss’ roof spanning a two-story-high common space. One challenging aspect of this project was that it started as a steel design. Keen to make the building a showcase for sustainability, the university made the decision to use wood part way through the design process. Noting that he may have made different choices had he started with wood, architect Tom Chung of Leers Weinzapfel Associates said, “Generally, mass timber doesn’t have to radically change the design concepts we already use; we can accomplish what we are already familiar with in steel and concrete. Steel post-and-beam can be done as glulam post-and-beam. Concrete/masonry shafts can be done in CLT. Steel/concrete floors can be CLT/concrete floors. A steel deck roof can be a CLT roof. Steel braces can be glulam braces. For the UMass project, we went step by step, asked ourselves what the precedents were and how we could go about maximizing the use of timber. Chung also said that educating code officials is an important part of the process. The UMass project team was in constant communication with a Massachusetts state building inspector and, because the building represented a new type of construction, also went before the Massachusetts state board of appeals for official approval. 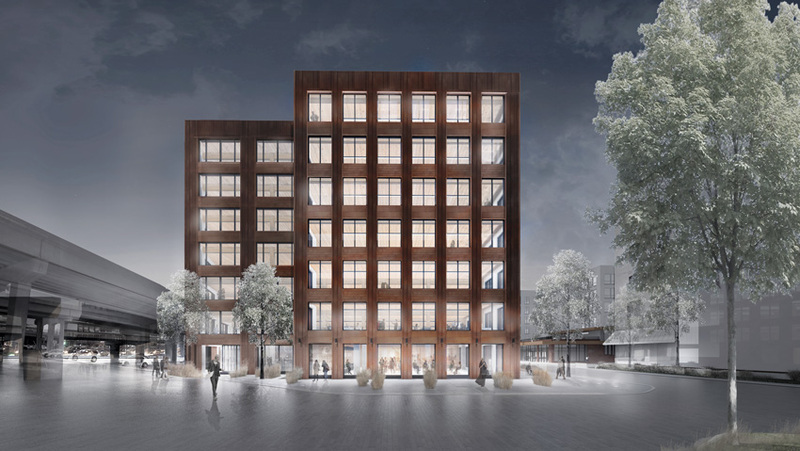 The project was approved after the team was able to demonstrate its performance capabilities as well as the long history of mass timber structures in Europe and Canada. Scheduled for completion in 2017, the UMass project is a combination of Type IV and IIB Construction.